bStockBuys | Crazy good deals! The 'U' shape offers not just seating. With the ottoman placed inside the set, it creates an oversized lounge for a big family. Multiple layouts. 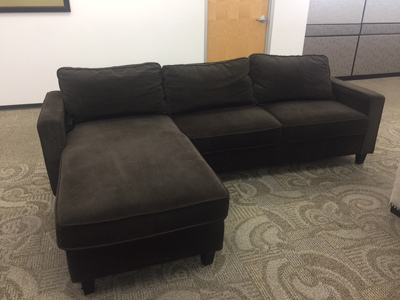 Includes 3 chairs, 2 corners & 1 ottoman. 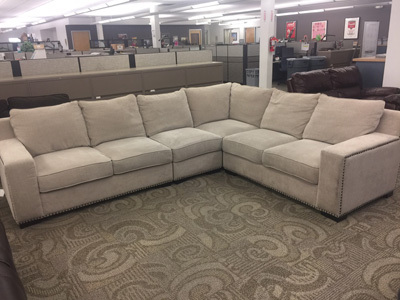 This Bainbridge 4-piece fabric sectional features nail head trimmed accents, deep seating & contemporary styling. Light tan color. Easy care soft microfiber fabric. A few very minor dark spots noticeable on fabric. 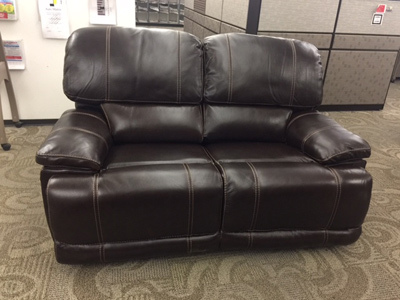 The Barrett Top Grain Leather Reclining Set is the epitome of comfort and relaxation. 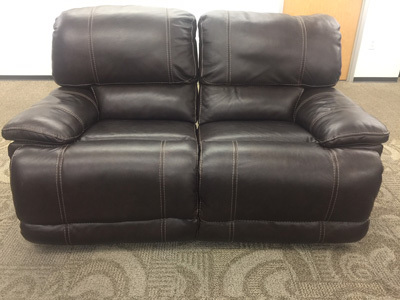 Includes reclining sofa and reclining loveseat. Some minor tear on a corner and two scuffs on back. 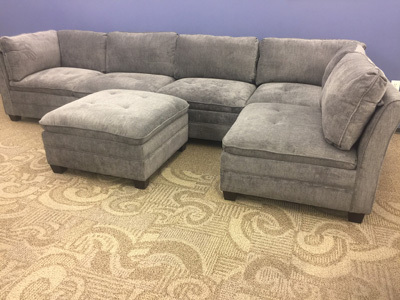 This cozy Reversible Fabric Chaise Sectional features soft microfiber with high density foam seats for comfortable seating with a sturdy hardwood frame. Dark brown. Good condition. 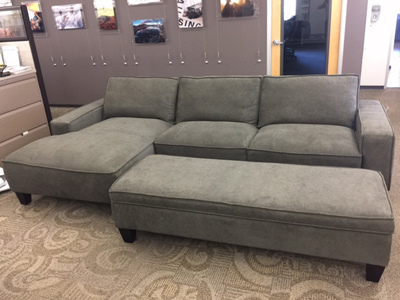 This fabric chaise is covered in a durable gray fabric that is easy to clean. The ottoman cushion opens to reveal a generously sized storage ottoman, or it can be positioned to create a larger sleeping area. Perfect condition! This inventory is considered “bStock”. "bStock" is a term applied to products that have been returned to a store, overstocks, scratch and dent items, open box, etc. Items are offered for sale at deep discounts because there is some risk associated with purchasing these goods. Some items may have missing parts, cosmetic damage, functional challenges, signs of some use, etc. Other items may be in a factory sealed box in perfect working condition. Please read the full descriptions. Merchandise has been visually inspected as much as possible by the newspaper staff, but bStockBuys.com offers no warranty or guarantee on any purchases. All items are sold “as-is” and no returns are accepted. Simply stop by the Idaho Press-Tribune office located at 1618 N. Midland Blvd in Nampa Monday through Friday 8:30 AM to 5:00 PM. We accept cash, checks and major credit cards. Subscribers are also offered next-day driveway delivery for FREE. bStockBuys.com is a product of the Idaho Press-Tribune LLC. Over the past decade our traditional classified model has been disrupted significantly while online e-commerce has grown exponentially. We believe this creates an opportunity for a new model which we call bStockBuys.com. Statistics report that up to 30% of online purchases are returned to the retailer. The reasons for returns could be a poor fit, wrong color, buyer’s remorse, etc. These returned items rarely find their way back to shelves because it’s too expense to repackage and restock this inventory so it is wholesaled. We purchase this inventory by the pallet and offer it to you at deeply discounted prices. We can even offer free delivery if you’re a subscriber to the Idaho Press-Tribune. It’s truly a win-win for everybody! Please read the full description of each item before you purchase. The products available are offered only on an “as-is / where-is” basis. 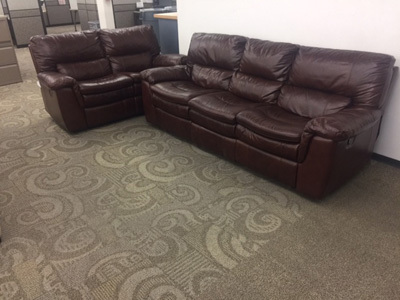 Such products have been returned to a store, overstocks, scratch and dent items, open box and some items may have missing parts, include cosmetic damage, functional challenges, and/or signs of use. THE IDAHO PRESS-TRIBUNE LLC, TO THE FULL EXTENT LEGALLY PERMISSIBLE, HEREBY DISCLAIMS ALL REPRESENTATIONS AND WARRANTIES, INCLUDING FITNESS FOR A PARTICULAR USE, RELATED TO THE PRODUCTS. ALL SALES ARE FINAL AND NO RETURNS ARE PERMITTED. IN NO EVENT SHALL IDAHO PRESS-TRIBUNE LLC BE LIABLE FOR ANY SPECIAL, PUNITIVE, EXEMPLARY, INDIRECT OR CONSEQUENTIAL DAMAGES, OR ANY OTHER DAMAGES OF ANY KIND, INCLUDING BUT NOT LIMITED TO LOSS OF USE, LOSS OF PROFITS, OR LOSS OF DATA, WHETHER IN AN ACTION IN CONTRACT, TORT (INCLUDING BUT NOT LIMITED TO NEGLIGENCE), OR OTHERWISE, ARISING OUT OF OR IN ANY WAY CONNECTED WITH THIS AUCTION OR THE PRODUCTS SOLD HEREBY. IN NO EVENT SHALL THE AGGREGATE LIABILITY OF IDAHO PRESS-TRIBUNE LLC (WHETHER IN CONTRACT, WARRANTY, TORT (INCLUDING BUT NOT LIMITED TO NEGLIGENCE), PRODUCT LIABILITY, STRICT LIABILITY OR OTHER THEORY) ARISING OUT OF OR RELATING TO THE USE OF THIS SITE, INCLUDING ANY PURCHASE OF INVENTORY, EXCEED THE COMPENSATION YOU PAID TO THE IDAHO PRESS-TRIBUNE LLC. bStockBuys.com operates in Emmett, ID at 120 N Washington Ave.